Our executive desk plates come in a piano finish with or without a holder for business cards. 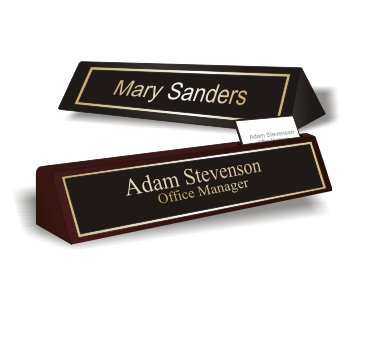 Our specialty desk plates are made of aluminum and allow for multiple name plates either two on one side or two sided (engraved name plates are included) To see an overview of the various options click the "Exec/Special Desk Plates" link above. 2" x 8" 2" x 10"